What would your last meal request be if you were on death row? This question was brought up during a random conversation I had with my siblings last week. It didn’t take long for me to decide that a succulent, juicy, and tasty Bacon Bleu Cheese Burger would be my last meal request on this earth. The words bacon, bleu cheese, and/or burgers, excites me and makes my mouth water. The smoky and salty flavor of the bacon and the tangy and piquant taste of the bleu cheese make it the perfect combination of toppings on burgers. I love it. For this recipe, I just K.I.S.S.’ed (K.I.S.S. stands for Keep it Simple, Stupid) it. 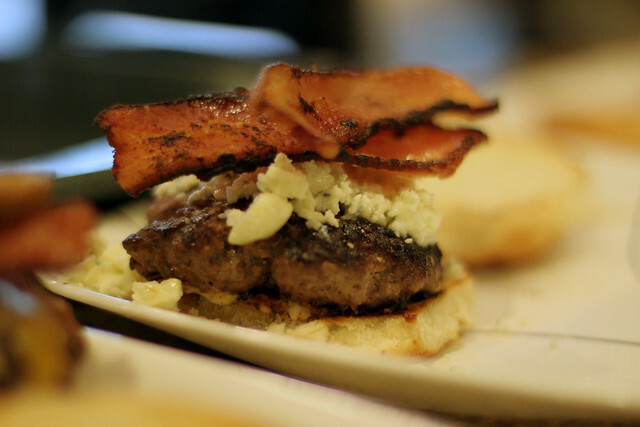 I cooked the burger and topped it with bleu cheese and bacon. 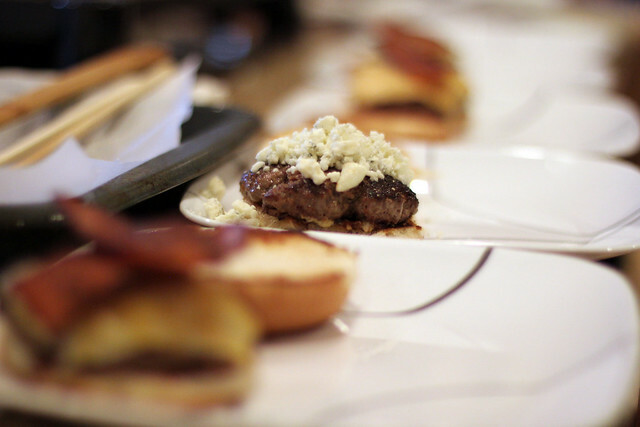 Other Bacon Bleu Cheese burger variations I’ve seen include stuffing bleu cheese between two patties, mixing bleu cheese with the ground beef or making a bleu cheese dressing/sauce. I didn’t have time for all of that. The sooner I could prepare and cook the burger, the sooner I could eat. Unfortunately, before Jane could take the picture of the dressed up bacon bleu cheese burger, I already started eating. On another note, I liked cooking the burgers on my electric griddle. The built in drip tray collects A LOT of grease during cooking process. It gave it a healthier feel even though it probably wasn’t. In a large bowl, mix the ground beef, salt, and pepper. Form 3-4 burgers create a small well (indent) in the middle of each patty, cover, and refrigerate for at least half hour. Heat griddle to MEDIUM-HIGH heat. Tip: If you are cooking indoors line counter top or table with newspapers because grease is going to splatter all over the place. 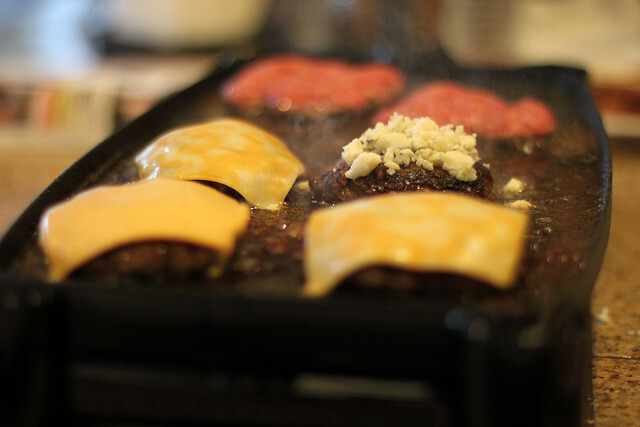 Put patties on griddle. Cook each side for 5 minutes, or until done. 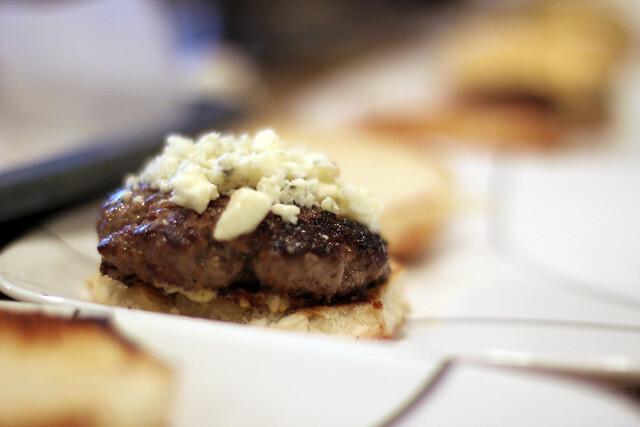 With about 2-3 minutes of cooking time left, put bleu cheese crumbles on top of the patties and toast buns on the griddle to toast. Assemble burger with your favorite toppings and enjoy!